The FFFF was made initially for my wife, Val. 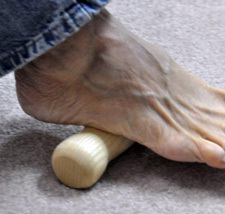 She developed Planter Fasciitis and the podiatrist told her that she needed to roll her foot on a firm object to alleviate the pain. I tried a few shapes and finally settled in on the one that I am now selling. When she uses it, she gets nearly instant relief from her symptoms. To use the FFFF, take off your shoes, sit down on a comfortable chair, and roll your foot on the FFFF. It is as simple as that. After a day of standing on your feet, it is heaven to use the FFFF to soothe your feet. CAUTION: When you are done using the FFFF, please don't leave it on the floor as it can become a trip hazard! They are made out of a variety of hardwoods of my choosing.